I was up at 5am having had a good nights rest. There was a full moon but was just on the southerly horizon. There had not been a breath of wind all night or the early morning. The carpers had been very busy during the night with plenty of fish being caught. This early in the morning the lakes water felt quite warm. I cast out about 1 pint of hemp with my splomb and it landed on the money each time. I had both rods out at 5.15am. The weather looked fair again for the day. At 5.45am I had a nice slow take which resulted in lifting into another fighting tench. This one got me weeded a couple of times. I’m using Drennan 2lb t/c bream and tench rods which have plenty of back bone to ease fish from the weed but are subtle when you have fish right under the rod tip. The tench was duely landed and weiged 4lbs 9oz. I’ll write more in the tatics on the actual makeup of this rig but here is a photo for now. The carper were very busy still, with even more fish caught. 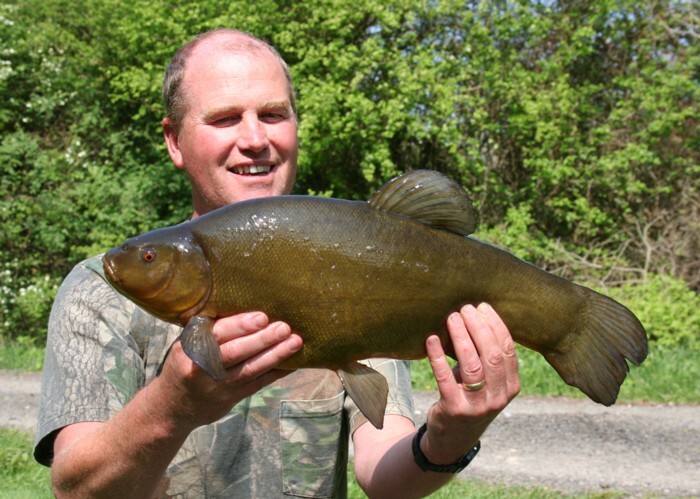 The tench were not rolling or fizzing so much as the day before, conditions though were similar. I recast every hour to keep the bait going in. The air temperature increased and by 10.30am there were 100’s of carp on the surface once more. I’ve never seen anything like it before. At 12.30pm I had another blistering take and once more the fish got me weeded. I’m using a back lead to hold the line tight to the weed on the bottom, I’m starting to wonder whether this isn’t helping me? A couple of carpers moved into swims either side of me during the the next 15 minutes. The one to the left anouyed the bloke opposite by casting almost onto one of his lines while feature finding. A bit of verbals went on for a while. Then he started to cast very close to where I was fishing. As he was pulling the marker float back my alarms sounded and off went the bait runner. Luckily it wasn’t him but a fish. The take was similar to the last one but this time the fish stayed on, she took me to the right where there was some weed and it got stuck for a while, but gentle pressure saw it on the move again. Soon it was within sight and I could see that it was a good tench. I’m always pleased when the net evelopes the fish and it’s mine. Well on the scales she went 8lbs 5oz so a really good fish and plenty of time to get larger. 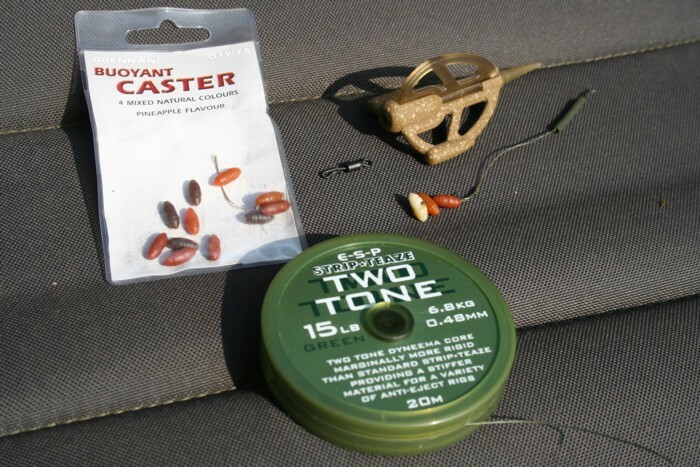 The afternoon wore on towards evening and at 4.45pm I had another sreaming take and hooked into something that started to take line, no tench this time. I had it on for about 1 minute until it went right and found the weed bed and the tiny size 12 hook came out. One of the things I gotten into is checking the hooks for sharpness before casting out and if necessary sharpening. At 7.05pm I had another take this time form a small tench by the feel of things only for the hook to fall out. Then disater at 7.50pm just before I packed up. I had this savage take that broke the hooklink material. Now 15lb braid and plastic coated I just don’t understand. I’m using 10lb main line so this have gone first. So that was it for the evening. So 5 tench in 36hrs is not a great haul but it shows that they are begining to move into the bay. I just hope that they continue to move in there, that’s if there is enough water as there seems to be plenty of carp around to fill the place. This entry was posted on Thursday, April 21st, 2011 at 2:13 pm	and is filed under Uncategorized. You can follow any responses to this entry through the RSS 2.0 feed. Both comments and pings are currently closed.